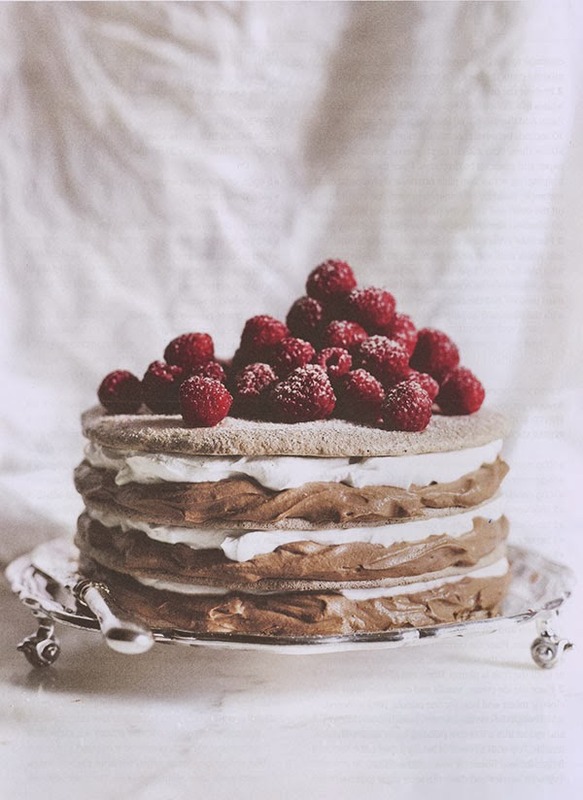 Roséline of the utterly lovely This is Glamorous shares her delectable recipe for Chocolate Hazelnut Pavlova with Marinated Raspberries — perfect for a romantic New Year's Eve dinner for two. 1 To marinate the raspberries, place them in a bowl with the icing sugar and rum, and mix gently. Set aside. 2 Preheat the oven to 120°C/gas mark ½‎. Place the egg whites in an electric mixer and whisk on high until stiff peaks form. Gradually add 240g of the icing sugar, a tablespoon at a time, whisking for 30 seconds between spoonfuls. Scrape down the sides of the bowl and whisk for further five to seven minutes, or until thick and glossy. Add the cornflour, hazelnuts and cocoa, and whisk until well combined. 3 Cover two baking trays with baking paper and draw two 18cm circles on each one. Divide the mixture between them, using a palette knife. Bake for 30 minutes, or until just crisp. Turn the oven off and allow to cool inside for 30 minutes. Remove and allow to cool completely. 4 Place 375ml of cream in a pan over high heat and bring to boil. Remove from heat, add the chocolate and stir until smooth. Allow to cool completely, then place the mixture in a bowl with the mascarpone and whisk until stiff peaks form. Place the remaining cream and icing sugar in a separate bowl and whisk until soft peaks form. 5 Top one pavlova round with a third of the chocolate cream and a third of the plain cream, and repeat with the remaining pavlova rounds and creams. Top with the marinated raspberries and dust with icing sugar to serve.